Thallus: squamose to foliose, often in irregular to entire rosettes, 2-3 mm diam. (rarely larger), on a well developed hypothallus lobes: contiguous to partially overlapping, fan-shapped, 4-5 mm wide, up to 9 mm long, deeply incised, ± ascending, paler margin upper surface: blue-gray, ash-gray to pale brown (when in exposed habitats), shiny centrally, scabrid towards the margins lobules: soredia-like (gymnidium), decorticated, marginal, sometimes totally covering the thallus, particularly in central parts upper cortex: paraplectenchymatous, 40-50 µm thick Apothecia: unknown in American material, elsewhere rare, up to 1.5 mm diam. in European material; disc: brown with thalline margin that is usually dissolved in 'soredia'; exciple: subparaplectenchymatous, 30-40 µm thick; hymenium: mostly hyaline but brown above, partially I+ persistently blue (in vicinity of the asci), 110-150 µm high asci: clavate to subcylindrical, without an amyloid apical apparatus, 8-spored ascospores: simple, colorless, ellipsoid, 20-24 x 10-12 µm (with an epispore; otherwise 15-19 x 9-10 µm) Spot tests: thallus K-, C-, KC-, P+ orange Secondary metabolite: pannarin. Substrate and ecology: on bark or mossy rocks in the cool-temperate regions World distribution: widely distributed in temperate parts of the Northern and Southern Hemispheres Sonoran distribution: cool-temperate parts of Arizona and adjacent Mexico (rather high altitude, about 2.000 m). Notes: It is the sorediate counterpart of P. rubiginosa. 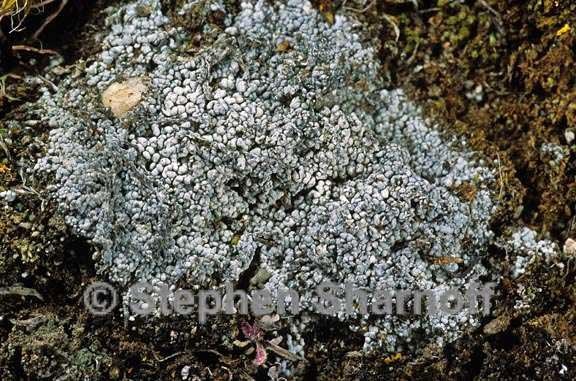 Morphologically it may be confused with Fuscopannaria mediterranea, which is P- and lack pannarin, or in its young stages with Pannaria tavaresii when the latter species cylindrical isidia are not fully developed.